Image caption Former Labour MP Sion Simon said he was "very disappointed"
Birmingham voters have rejected plans to create an elected mayor in the city. Birmingham was among 10 English cities voting in mayoral referendums on the same day as the local council elections. In Birmingham 57.8% voted no. Eight other cities have rejected plans to replace local council cabinets with directly elected mayors. People backed the idea in Bristol, where the contest for the new job will take place in the autumn. A total of 120,611 people voted no, while 88,085 backed the proposal, Birmingham City Council said. 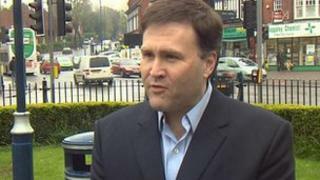 Former Labour MP Sion Simon, who quit his Birmingham Erdington seat before the 2010 general election to stand as an elected mayor, said on a personal level it was "a massive gamble" and he was "very disappointed". Mr Simon added: "Sometimes you do things, take a risk, because you believe in something and it doesn't come off. "But it was never really about me. It was about the city and it was about the change that we need in Birmingham." The new leader of the now Labour-controlled council, Sir Albert Bore, who had announced his backing for would-be mayor Liam Byrne, said he had always taken the view it was for residents to decide on the governance of the city. He said: "For 12 years I've argued for an elected mayor for Birmingham and I've maintained that, even though I gave up the idea of becoming myself the first elected mayor of Birmingham." Mr Byrne, the shadow work and pensions secretary, said an elected mayor for Birmingham was now "off the table", according to BBC Midlands political editor Patrick Burns. The Hodge Hill Labour MP thanked those who supported the yes campaign and added: "Albert and me, our job now is to get four-square behind our brilliant new Labour council." Birmingham Campaign Against an Elected Mayor claimed that if appointed, a mayor would "rule as dictator", not be accountable for four years and receive a salary of more than £200,000 a year. Liberal Democrat MP for Yardley John Hemming, who campaigned against having an elected mayor, said Birmingham people had declared "resoundingly they want accountable democracy". He added: "That is a system where you don't appoint a dictator to do whatever he or she feels like and that they're not going to go along with something proposed by the political elite." The Cities Minister Greg Clark said: "I'm personally disappointed because I've always believed that a mayor of Birmingham would be great for the city." Manchester, Newcastle, Nottingham, Sheffield, Wakefield, Coventry, Leeds and Bradford voted "no". Doncaster voted to keep its elected mayor.